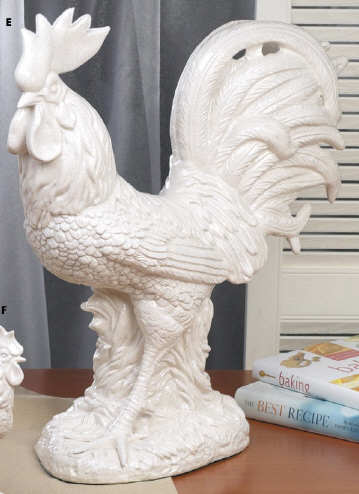 This magnificent rooster is completely neutral, perfect for any home decor in any color palate. His grand scale makes it quite a prominent piece. The detailing of the sculpture is striking and the soft crackled patina give this piece an old world feel. It measures 25" by 11" by 26". This item is a specialty item and WILL BE SPECIAL ORDERED ONCE YOUR ORDER HAS BEEN PLACED. This item will show "in stock" status in the shopping cart, meaning it is in stock with the manufacturer, not necessarily in stock at our warehouse. Please allow 2-3 weeks for your items to arrive. All orders are charged at the time the order is placed. If you need the item more quickly, please call for additional help. When ordering "Special Order" items, your entire shipment may be held until all items are in stock. It is our policy to hold shipments until all the items have arrived.